As we can see from the Bodger Family Tree, Sarah's parents were Charles Bodger (1797-1867) and Jane Wright (1803-1860). Her paternal grandparents were probably James Bodger (1769-c1797) and Sarah Chandler although this has still to be confirmed. Charles Bodger was born at Kings Ripton in the county of Huntingdonshire in England. His wife Jane was born at Hartford which is on the outskirts of the town of Huntingdon also in Huntingdonshire. They were married in the All Saints Church of England (pictured on the left and below) in the village of Grafham on 26 May 1823. The transcript of the wedding shows that Jane was under age and had to have parental consent to marry. Both the bride and bridegroom were said to be 'of this parish', and signed the certificate with a 'mark' or cross. The witnesses to the wedding were James Wright and Rebecca Favell. The UK censuses show that after their marriage, Charles and Jane lived at Grafham where Charles worked as an agricultural labourer. In 1841 they had with them: Joseph (15 years), James (10), Charles (8), William (5) and Walter (2). 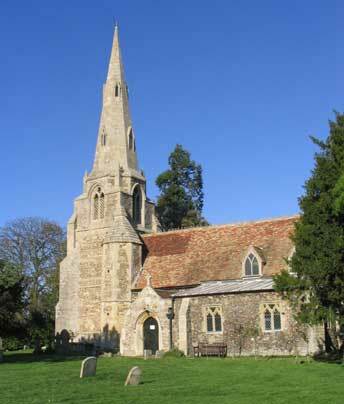 Sarah was probably visiting Charles' sister Mary Lyon in Elsworth in Cambridgeshire. In 1851 they had living with them: Joseph (24), William (15), Walter (12) and David (8). James was doing his apprenticeship with his uncle-in-law Joseph Wright in Broughton. Sarah (22) had by this time married her cousin John Wright and was living with him in Broughton (see below). The National Burial Index indicates that Jane Bodger died at the age of 57 years and was buried at Grafham on 13 September 1860. The 1861 census shows the 61 year-old widowed Charles living by himself on the High Street of Grafham. Charles died at Grafham six years later and was buried in the local cemetery on 7 January 1867. Charles and Jane had seven children whose lives and times are described below. Known details of their children and grandchildren can be seen on my Rootsweb site for the Wright and Bodger Families. Joseph Bodger was living with his parents in Grafham at the time of the 1841 and 1851 censuses. He married a local girl Anne Layton (born in Grafham in 1833) at Grafham in 1856. Ann's parents were George and Elizabeth Layton/Leighton who came respectively from Stow and 'Winick' in Huntingdonshire and were living at Grafham at the time of the 1851 census. The 1861 census has Joseph (a 24 year-old agricultural labourer) lodging at the house of William and Mary Peacock at Eye in Northamptonshire. His wife Ann (29) and daughter Naomi (9) were living with Ann's parents at Grafham (and next door to Charles Bodger jnr). The 1871 and 1881 censuses have Joseph and Ann back in Grafham. Also present in 1881 were Joseph's younger brother James Bodger and two nephews: Harry Layton and John Charles Bodger (James' only son). They were living next door to Ann's parents, George and Elizabeth, who had with them their son George (36), daughter-in-law Elizabeth (34) and three grandchildren, Fred (3), Arthur (1) and Mary (3m). The 1891 census shows Annie Bodger, a 59 year-old labourer's wife who was said to be married, living in the village of Grafham. With her was her grandson Leslie Joseph Sharman, the son of Frederick and Naomi Sharman (nee Bodger). At the time Joseph was away working in Bedfordshire. The Catherine House records show that he died in the Biggleswade district of Bedfordshire shortly after the census was taken. The widowed Anne was still living Grafham in 1901. With her this time was her granddaughter Annie Jane Tysoe (nee Sharman), Annie's husband John and their four children (see below). Joseph and Anne's only daughter Naomi Bodger married Frederick Sharman at Grafham in 1870. In 1871 the couple and their 4 month-old daughter, Anne Jane Sharman, were living with Naomi's parents at Grafham. In 1881 they were at the home of Frederick's father, William Sharman (a 69 year-old widower, woodman and parish clerk who was born at Grafham) at Grafham Street in Grafham. Also present were Frederick and Naomi's three children - Annie Jane Sharman (10), Ernest Bodger Sharman (8) and Frederick P. Sharman (2) - Joseph's cousin May Layton (6) and a visitor Sarah 'Phantin', a 19 year-old domestic servant who was born at Stanwick in Northamptonshire. The 1891 census has Frederick (41) and Naomi (39) living in the village of Grafham. Also present were Ernest (18, agricultural labourer), Frederick (12, plough boy), William (6) and Maud Mary (2). 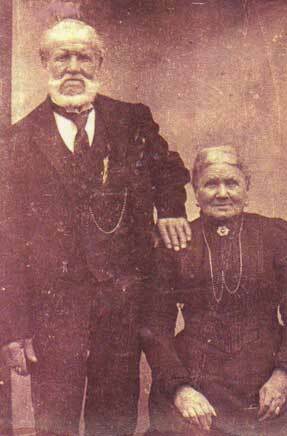 The 1901 census has Frederick (57) and Naomi (49) still living in a cottage in Grafham village. Also present were their children: Frederick (23 year-old woodman), Leslie (19 year-old agricultural labourer), George (16 year-old agricultural labourer), Maud (12) and Florence (3) all of whom had been born at Grafham. Ernest (a 28 year-old railway worker) was married and he and his wife Sarah Jane Sharman (nee Cowley) were living on Station Road in Grafham. Annie Jane had also married (to John Tysoe of Brampton in 1893) and she, John and their four children - Frederick, Agnes Naomi, Frank and Lilian Maud - were living at Grafham with Annie's grandmother Ann Bodger (nee Layton). 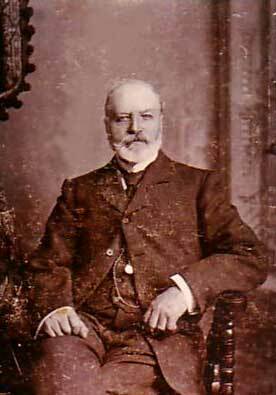 Frederick Sharman died in 1920 at the age of 72. He is buried in Grafham churchyard with his wife Naomi who died in 1922 at the age of 70. The churchyard also has in it several other Sharman family graves. One of John and Annie's descendants, Jayne Tysoe, sent us the photo on the right which is of a memorial stone in the All Saints Anglican Church at Grafham and shows that Frank Tysoe from Grafham was killed in the First World War. The same plaque notes that an F. P. Sharman (probably Frank's uncle Frederick) and Frederick Tysoe (Annie and John's other son) also served in the British forces during the First World War. The Commonwealth War Graves Commission website confirms that a Frank Tysoe of the 8 Battalion Royal Fusiliers died at Arras on 19 Jul 1917 and is commemorated on the Arras memorial. Unfortunately it provides no details of his age or NOK. Jayne tells us that John and Annie's son, Frederick Ernest Sharman Tysoe, became a railwayman. In 1920 he married Hilda Evelyn Janet Tilling and settled in Hilda's home town of Long Eaton in Derbyshire. They had five children: Kathleen who died in childhood, Frederick Stanley who was killed during the Second World War and is buried in Heliopolis in Egypt, Hilda Marion, Marjorie and Frank William Tysoe. Jayne, Frank's daughter who has been researching the family tree, still lives in Long Eaton. She adds that 'a fascinating link is that the death certificate of David Bodger, son of Charles and Jane, shows that he died on 7 May 1896 while lodging in Long Eaton although the reason for his presence in the town remains a mystery'. Sarah Bodger (1828-1910) married John Saunders Wright (1826-1888). Sarah Bodger was born in Grafham in Huntingdonshire in England in 1828. The parish transcripts show that she was baptised with her younger brother James at Grafham on 24 April 1831. She married her cousin John Saunders Wright at Grafham on 28 February 1848. He was a batchelor aged 22 years and she a twenty year-old spinster. Both were said on the wedding certificate to be labourers where he lived in the village of Warboys and she in Grafham itself. The marriage was witnessed by Sarah's brother James Bodger and an Elizabeth Eynsby where all signed the certificate with a 'mark'. The 1851 English census showed John Saunders (aged 25 years) and Sarah Wright (22) and their one year-old daughter, Jane Elizabeth Wright, living in the village of Broughton in the county of Huntingdonshire. Living with them was a 56 year-old widow, Mary Hunter, who was a nurse and former school mistress. The following year the family emigrated to Australia where John had been employed to work on Philip Russell's sheep station (pictured on the left) at Carngham in central Victoria. Click here to read about John and Sarah's life in Australia. The parish transcripts show that James was baptised with his sister Sarah at Grafham on 24 April 1831. The 1841 census shows him living with his family at Grafham. In 1851 James was doing his apprenticeship with his uncle-in-law Joseph Wright in Broughton. The Catherine House Records show James Bodger and Naomi Fairey were married in the St Neots registration district of Huntingdonshire in 1859. The 1861 census shows James (30 and working as a shoemaker) living at 2 North Street North in Aldershot in Hampshire with his wife Naomi (26, milliner and dressmaker). Naomi had been born at Easton in Huntingdonshire. 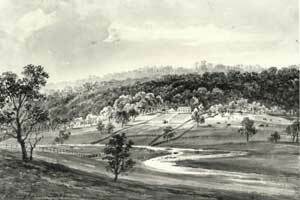 In 1865 James and Naomi Bodger (aged 31 and 30 respectively) emigrated to Australia on the FOREST RIGHTS. They had a child, John Charles William Fairey Bodger (1872-1965), in Streatham in Victoria in 1875. The boy was baptised in the Carngham Church of England. The baptism notice records James as a station overseer who resided in Emerdale at Streatham. Naomi Bodger died at Streatham in 1880, aged 45 years (we have not been able to find her gravestone). According to her death certificate Naomi's father was John Fairey and her mother was Thomasine Voss. Gill Gorman writes that Thomasine (usually spelt Thomasin) was the illegitimate daughter of Elizabeth Lawson of Eynesbury (the family think that the father was a John Dixey although this has not been confirmed). Elizabeth married Richard Voss in 1809. Thus although her marriage certificate records her surname as Lawson, Thomasin was probably generally known as Thomasin Voss. Gill adds that after Naomi's death, James and his son returned to England where James remarried. This is confirmed by the 1881 census which shows James and his son John Charles living at Grafham in the house of James' older brother Joseph Bodger. The 1891 census shows James (56, cordwainer) living at Ruislip in Middlesex with his new wife Ann (50 and said to be born in Farnborough in Kent) and son John (16 year-old gardener born at Everdale in Victoria). The Catherine House records show that a James Bodger and Ann Holmes were married in the Lewisham district of Kent in 1886. By the turn of the century, James (70) was living on Montague Road West Hillingdon in Middlesex with his wife Ann (61) and son John (26 and working for a wholesale grocer). Ann was said to come from Sevenoaks in Kent. The 1911 census shows James (an 80 year-old bootmaker) and Ann (71, Farnborough Kent) living at 41 Vine Street in Uxbridge in Middlesex. The census return indicates thay had been married 25 years and had no children. The Catherine House Index shows that James and Ann both died at Uxbridge, he in 1911 and she in 1920. In an interesting turn, the same source shows that John Bodger jnr married a Sarah Dixey in the Ware registration district of Hertfordshire in 1901. The 1911 census has John, a 36 year-old chauffeur born in Victoria in Australia, living at Hermitage Lodge on Park Road in Uxbridge in Middlesex with his wife Sarah (35 and born at 'Pebmarsh' in Essex) and their son John James Dixey Bodger (8, Uxbridge Middlesex). The census return tells us that John and Sarah had been married nine years and had only the one child. The Catherine House Index further shows that John James Dixey Bodger (1902-89) married Lilian Sibyl Norman (1916-99) in the Uxbridge Registration District of Middlesex in 1939. We don't know if they had any children. John's parents, John snr and his wife Sarah, eventually moved from Uxbridge to Bishop's Stortford in Hertfordshire where he died in 1965 and she in 1999. In yet another interesting twist to the tale, Gill Gorman has subsequently discovered that one of Naomi's brothers, Amos Fairey, married Annie Church, Gill's great-grandmother and first cousin of Sarah Cox, the wife of Charles Bodger, the younger brother of James (see below). Gill is thus twice connected to the Bodger family! She also tells us that another of Naomi's brothers, Josiah Fairey, 'travelled to Australia in 1870, and another brother, James, went to New Zealand. Two sisters and a brother went to the US with their widowed 70 year-old mother' (recorded as 'Thomagin Ferry' in the 1880 Kansas census). A copy of the wedding certificate provided by Irene Restall, shows that Charles married after banns Sarah Cox at Grafham on 1 May 1855. Charles was described as a 22 year-old bachelor who was living at Grafham. He was a groom by profession and his father was Charles Bodger, a labourer. Sarah was a 19 year-old spinster from Buckden in Huntingdonshire. Her father was James Cox. The wedding certificate was witnessed by a William Sharman and a Sarah Fisk (?). The 1861 census shows 'Charley' Bodger (a 28 year-old general servant) living on High Street in Grafham with his wife Sarah (25) and children Harry Glover, Edwin and Louisa. At the time of the 1871 census Charles (36) and Jane (33) were living at Hill End in Harefield in Middlesex. With them were Harry Glover (13, Grafham), Edwin (11, Grafham), Louisa Jane (10, Grafham), Elizabeth Ann (8, Grafham), William Walter (5, Buckden), Charles John (3, Kings Langley Hertsfordshire) and Frederick David (1, Kings Langley). The 1881 census has Charles (40) and Sarah (44) at 1 Wilton Cottage in Hillingdon in Middlesex. With them this time were Edwin (21 year-old labourer), William (15, baker), Charles (13, gardener), Frederick (12), Sarah Ann (9, Harefield, Middlesex) and Florence (2, Hillingdon). By the 1891 census, about when the photo on the left was taken, they were living at Walthamstow in Essex with four of their ten children: William, Charles, Frederick and Ada. In 1901 Charles (66) and Sarah (64) were living with their youngest daughter Ada Reen and her husband Albert F. Reen at 22 Collingwood Road in Walthamston in Essex. Also there was Albert and Ada's daughter, Ada, who was born at Walthamston in 1896. By this time Charles and Sarah's two sons, William and Frederick, were married and were also living in Walthamston. Both Charles and Sarah died in their local workhouses, 'the equivalent', Irene Restall muses, 'of today's nursing and rest homes, but without the home comforts!' Charles, aged 72 years, died in the Leytonstone Union Workhouse on 7 May 1906. Sarah died in the West Ham Union infirmary five years later. She was 74 years old. They had had altogether ten children: Harry Glover, Edwin, Louisa Jane, Elizabeth Ann, William Walter, Charles John, Frederick David, Sarah Ann, Ada and Florence Bodger. What of Charles and Sarah's children? Irene Restall tells us that Harry Glover Bodger married first Margaret Harriet Toplis in Holborn in London in 1876 and then Bertha Louise Palmer in 1924. Harry and Harriet lived in London after their marriage and had three children there: John Charles, Clara Jane and Alfred Harry. She continues that their youngest son, Irene's grandfather, Alfred Harry Bodger married Harriet Emily Seymour at Clerkenwell in London in 1904. Research done by her and Len Hammond from Bournemouth (the grandson of Elizabeth Ann Bodger and George John Harding James) shows that Alfred and Harriet had six children: Alfred Edward (born in London in 1905), Harriet Margaret (London, 1906), Clara E., Violet J., Leonard Francis and Frederick Henry (Irene's father). Frederick Henry ('Fred') Bodger (pictured on the left in 1933) was born at Inverness in Scotland in 1918 and died at Glasgow in 1971. He married a Welsh girl, Agnes Ada Williams (1914-1982), at Edmonton in London in 1938 and had three daughters: Cynthia, Elizabeth and Irene. Cynthia and her twin sister, Elizabeth, were born at Glamorgan in South Wales where their mother had been evacuated to from London during the Second World War. Their father was then serving as a private soldier in the Wiltshire Regiment. In 1964 Cynthia Tizzard and her husband David Tizzard and their two daughters emigrated to Australia on the ORCADES. They settled in Ballarat in Victoria where they and their family (pictured on the right in Ballarat in 2000) have lived for most of their 42 years in Australia. Cynthia and Elizabeth's younger sister, Irene Restall (nee Bodger) who was born at Hampstead in London, lived for a time in France with her second husband Brian David Restall (Brian was born at Portsmouth in southern England). They have since returned to England and live at Gosport only, Irene tells us, a few minutes walk away from where Brian's great-grandmother was baptised in 1844. Click here to see more photos of Frederick Henry ('Fred') Bodger and his family. Another of Charles and Sarah's descendant, Victoria (Vicky) Bremner nee Bodger, tells us that Harry and Margaret's eldest son, John Charles Bodger, married Mary Ann Harridge at Brecon in Powys in Wales in 1899. They initially lived at Brecon with Mary Ann's widowed mother, Emily Harridge, and later in London. The couple had at least three children Vicky is aware of: Clara Jane, John Joseph and David Henry Glover Bodger. 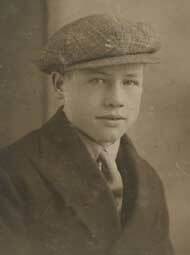 The last of these, Vicky's grandfather, was born on 27 April 1904 at Warrington in Cheshire/Lancashire. His birth certificate indicates that his father, John Charles Bodger, was then a corporal in the Army Pay Corps. Their second child, Vicky's father, was David John Alexander Bodger. 'He was born in June 1929 ... As a young man, he was a tank driver in the army, based in Egypt. He had a nasty accident where his left hand got shut in the tank door, and was very lucky that the whole hand wasn't completely mangled'. After being invalided out of the army, David jnr went to Bristol, where he worked as a ship's rigger at Avonmouth docks, and 'where his half-brother George Southgate was living. He met my mum on a blind date, whilst she was in between stints in the Winsley Sanitorium for TB'. Vicky's mother, 'Lilian Audrey Bodger (known always as Audry) and David were married on 3 July 1954 at the Kingswood Registry Office in Bristol. 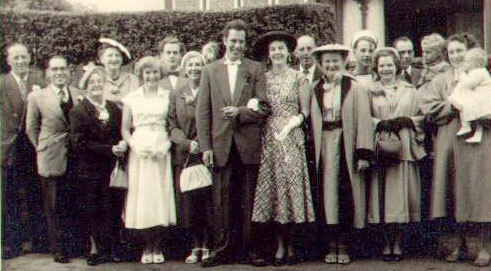 Wedding of David John Alexander Bodger and Lilian Audrey Williams at Bristol in 1954. David's father, David Henry Glover Bodger is on the far left of the photo next to his half-brother, George Southgate. On David's right is his mother Tessey Bodger nee Southgate nee Davenport. On her right is David's youngest sister. 'Around this time', Vicky continues', dad's parents David Henry Glover and his wife Tessey went to live in Australia [where they lived] 'for a number of years. Dad's two half-brothers, George and James Southgate also went over there, and are still there if they're still alive. I have lots of half-cousins in Australia who I've completely lost track of. Dad was a naturally brilliant mathematician, and he decided to train to be an accountant, and then became Company Secretary of Premier Transport in Bristol. My grandparents came back to this country around the late 60's early 70's and settled in the Oxfordshire area, first in Didcot I think, and then in Wallingford. Sadly, my parents divorced in 1969, and dad married again in 1973 and acquired 3 teenage step-children. In July 1976, he and my step-mother were on holiday in Dubrovnik, Yugoslavia, when he seemed to suffer from some sort of sun-stroke. He deteriorated very rapidly and died there, either of a stroke or a brain tumour'. 'My grandfather Henry Glover had already died in February 1974. I had only really met him a couple of times and don't feel I knew him at all. Mum says she thought both her in-laws were good-looking ... Dad was extremely good-looking as a young man, so I suppose it must have come from somewhere. Mum also tells me that David and Tessey ran a pig farm at some point, which really surprised me! After my grand-dad's death, gran went to live in Australia again, with her son James Southgate in Sydney, but it didn't work and she came back to Wallingford. Dad's death was a huge shock to her - as her only son, he was the apple of her eye! She went on to the ripe old age of 90, finally dying in September 1991 in Wallingford'. What of the other members of Charles and Sarah's family? We know nothing of Louisa, Charles jnr, Sarah Ann and Florence beyond their dates of birth. Edwin Bodger married Eliza Chapman, from Chalfont in Buckinghamshire, in Middlesex in 1881. The 1901 census shows Edwin worked as an 'electric light service layer'. He and Eliza were living at 106 Mayfield Road in Hackney in London. By this time they had at least eight children: Elizabeth Ann (18, Yiewsly in Middlesex), Louisa E. (16, St Luke's London), Lily Edith (13, Shoreditch London), Rosie Ada (11, St Lukes), Esther Emma (9, Dalston London), Edwin (7, Dalston), William Charles (4, Dalston) and Dorothy May (2, Dalston). 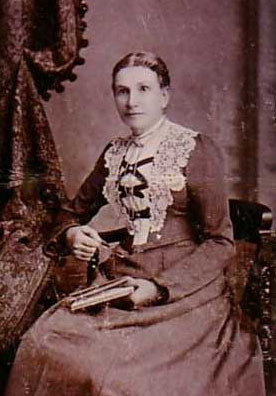 Elizabeth Ann Bodger married John George Harding James. We think that William Bodger married Louisa Price and had three children: Albert, Grace Everline and William Walter jnr. Frederick David Bodger married Louisa Maria Thain at West Ham in 1891. They were living at Walthamson in 1901 and had three children: Frederick, William and Louisa. Finally, as already described, Ada Bodger married Albert Reen and had at least one daughter, Ada. Baptised at Grafham on 17 July 1836, William was living with his parents there in 1851. A newspaper cutting obtained by Irene Restall indicates that he served in the 1st Battalion of The Rifle Brigade and 'went through the seige of Sebastopol for which he received two medals and a clasp'. 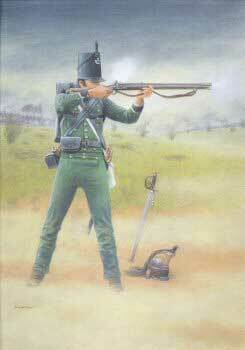 Both the 1st and 2nd Battalions of the Rifle Brigade fought in the Crimea, the 2nd leading the advance over the River Alma and both taking part in the hard fought battle of Inkerman and the long siege of Sebastopol where they suffered severely from the bitterly cold Russian winter. The report continues that William was one of the many who suffered from frost-bite and was sent to the Soutara Hospital where he was nursed by Florence Nightingale. On recovery he was sent back into the trenches where he 'had many marvellous escapes but was always fortunate enough to escape being hit by a shot. He had, however, severe bruises by stones, caused by the explosion of shells or big shots'. William came home with the Regiment of Lord A. G. Russell. After landing at Portsmouth they proceeded 'to Aldershot, where the Queen inspected the Army of 30,000 men. After being at home for two years, Mr Bodger went with the Regiment to Edinburgh, Glasgow, Penecuiche, Newcastle-on-Tyne and Sunderland, and then to Dublin and the Curragh Camp where H. R. H. the Prince of Wales was learning his drill'. After serving two years in Canada from 1861, William returned to England and was discharged from the Army at Winchester. He 'then joined the Police Force, serving under four Chief Commissioners: Sir Richard Main, Colonel Henderson, Sir Charles Warren and Mr Munro. He joined the Marylebone Lane Division on January 9th 1865, and was present at the disturbance at Hyde Park'. On 9 October 1865, William married Elizabeth Ann Ainsworth, the daughter of Daniel and Elizabeth Ainsworth nee Hills, at Grafham on 9 October 1865 (William and Elizabeth are pictured below). Elizabeth was born at Huntza Grafham in Huntingdonshire in 1841. At the time of the 1861 census, she was working as an under housemaid at 23 Grafton St in Hanover Square in Mayfair in London. After their marriage the couple lived initially at Marylebone in London. In 1870 William was promoted to Sergeant and transferred to Islington and then Leyton where he was made Inspector of Police. In 1881 William and Elizabeth were living at 1 Argyll Terrace in Leyton Low in Essex together with Elizabeth's widowed mother, 72 year-old Elizabeth Ainsworth (born at Hartford in Huntingdonshire). They were still there in 1891 with all their children except Hector who was undergoing training for the Royal Navy. By 1901 the family had moved to 56 Chadwith Road in Leyton. Elizabeth Ann Bodger nee Ainsworth died at Leytonstone in Essex on 23 January 1905, aged 64 years. The 1911 census shows William, a 75 year-old widower and police pensioner, living at 46 Fairlop Road in Leytonstone. Also present were Ada Elizabeth (40), William Ainsworth (38 year-old wheelwright), Francis Ainsworth ( 34 year-old sergeaant in the Royal Marine Artillery), Arthur Joseph (32 year-old shipping merchant's clerk) and Mabel Emily Bodger (27 year-old book publisher's typist). The census return indicates that only William snr and Francis had been or were married, William was said to have had 11 children, eight of whom were still living, Francis had been married three years and had two children. William Bodger snr died at Leytonstone on 7 February 1916. The UK National Probate Index shows that he was then living at 60 Browning Road in Leytonstone and probate from his will was paid to Frederick Ainsworth Bodger, a publisher's clerk. William and Elizabeth eight surviving children mentioned in the 1911 census were: Frederick Ainsworth Bodger (born in 1867 at Marylebone), Ada Elizabeth Bodger (1871, Marylebone), William Ainsworth Bodger (1873, Stoke Newington), Hector Charles Bodger (1874, Stoke Newington), Francis Ainsworth Bodger (1877, Loughton), Arthur Joseph Bodger (1879, Loughton), Mabel Emily Bodger (1884, Leyton) and Herbert Ainsworth Bodger (1888, Leyton). Click here to read what we know of William and Elizabeth's family and descendants. William Bodger and Elizabeth Ann Bodger nee Ainsworth. Born at Grafham in 1838, Walter served in the British Army at Farnborough in Surrey and then as a policeman in Kent (the 1871 census shows Walter - 32, born at Grafham and working as a constable of police - lodging at the police station at Upper Sydenham in Kent). The London parishes database maintained by Ancestry.com shows that Walter married Annie Spriggs (1852-1928) at St Peters Church Walworth in the parish of St Mary's in Newington London on 22 April 1873. Walter was said to be a 33 year-old policeman, the son of Charles Bodger, labourer (deceased). Annie was 23 years old, the daughter of Charles Spriggs, parchment maker. He was living at Holy Trinity Sydenham and she at 64 Lorrimore Street in Newington. The wedding was witnessed by Thomas and Emily Spriggs. The LDS database shows Annie Spriggs, daughter of Charles and Mary Spriggs, was baptised at Weldon in Northamptonshire on 11 June 1851. According to the 'Rudkin Family Tree' on Ancestry.com, Annie's parents were Charles Spriggs (1807-81) and Mary Ann Farren (1808-81) who were married in Little Weldon in Northamptonshire in around 1927 and had ten children before Annie: Charles, Thomas, Annie Maria, William Farren, John, James, Alice Elizabeth, Harriet and Emily Spriggs. The 1881 census shows Walter (44) living at 94 Maltham Road in Lewisham in Kent. With him were his wife Annie (29 and born in Weldon, Northampton) and son Walter C. Bodger (7 years old and born in Sydenham in Kent). The 1891 census shows Walter and Annie still living in Lewisham with their son Walter C. By the turn of the century, Walter had retired and he and Annie were at 12 Monarch Road in Lewisham. Their son, Walter Bodger jnr, had married Charlotte Annie Bayley and was working as a coal merchant in Lewisham in London (see below). The Catherine House Index shows that a Walter Bodger, born in around 1840, died in the Lewisham registration district of London in 1903. The 1911 census has Annie Bodger, 59 year-old widow, living at 12 Marnock Road in Brockley near Lewisham in Kent with three boarders: Hedley Neighbour (34), Launcelot Turner (30) and Ernest Wallis (30). We believe that Annie died in the Dover registration district of Kent in 1928. Walter and Annie's only son, Walter Charles Bodger (1874-1945), was married twice. His first wife was Charlotte Annie Bayley (1873-1927) who he married in the Dartford registration district of Kent in 1900. The 1901 census shows Walter and Annie, 28 and born at Erith in Kent, living in Lewisham where Walter was working as a coal merchant. The 1911 census shows Walter Charles (37 year-old clerk for a coal merchant, born at Sydenham in Kent) and Charlotte Annie Bodger (38, Erith Kent) living at 126 Hawson Road in Brockley near Lewisham with their son Walter Henry Bodger (3, Brockley). The census return indicated that Walter and Charlotte had been married ten years and had one child. Charlotte Annie Bodger died in the Southwark registration district of London in 1927. In 1940 Walter married Annie Augusta Quy (1885-1961), daughter of John James and Jessie Elizabeth Quy, at Lewisham. Annie was born on 26 August 1885 and baptised at Limehouse St Anne Poor House on 20 September 1885. The family were living at 19 Lyd Road in Bow at the time and John was working as a commercial clerk. Ancestry's marriages database shows that John James Quy and Jessie Elizabeth Bird were married in the Parish of Limehouse St Anne in London on 1 June 1884. Walter Charles Bodger died in the Greenwich registration district of Greater London in 1945. The UK National Probate Index shows that he was then living at 53 First Avenue in Bexley Heath in Kent and died in the Miller General Hospital in Greenwich on 31 January 1945. Probate was granted to Annie Augusta Bodger, widow, and Walter Henry Bodger, research chemist. The UK National Probate Calendar shows that Annie Augusta Bodger, widow of 4 South Road Herne Bay in Kent died in the Kent and Canterbury Hospital on 29 April 1961. Probate was granted to Cyril Gordon Quy, hotel porter. Ancestry's London Electoral Rolls shows that Walter and Annie's only son, Walter Henry Bodger (1908-79), was living with his father Walter Charles Bodger at 42 Oakcroft Road in Lewisham between 1930 and 1933. The Catherine House Index shows that he married Joy Ivy Marshall (1914-91) in the Lewisham registration district of Kent in 1935. According to the 'Hodgson Family Tree' on Ancestry.com, Joy was born on 26 September 1914 in Lewisham in London, the daughter of Eustace Henry Hodgson (1848-1915) and Jessie Marshall (who were married at Lewisham in 1905). Ancestry's London Electoral registers show Walter and Joy Ivy Bodger were living at 23 Greenlands Ave in the Borough of Wandstead and Woodford in 1964. According to the Catherine House Index, Walter died in the Southampton registration district of Hampshire in 1979 and Joy in the New Forest registration district of Hampshire in 1991. We don't think they had any children. A Google search shows that a Walter Henry Bodger holds two patents for self-hardening cement-based products used in floors, traffic and other surfaces. The 1851 census has David (8) living with his parents and siblings at Grafham. The 1861 census has a D. Bodger, a 19 year-old private soldier born at Graffham, on the strength of the 1st Battalion Rifle Brigade and located in North Camp at Farnborough in Hampshire. The 1871 census shows David (29 and single) serving as a corporal in the Rifle Brigade and stationed at Woolich in Kent. The Catherine House records show that a David Bodger and Caroline Wilsher were married in the Farnham district of Surrey in 1873. Their marriage certificate, a copy of which was obtained by David and Cynthia Tizzard, shows Caroline was then living in Chelmsford and was the daughter of Joseph Wilsher an ostler. 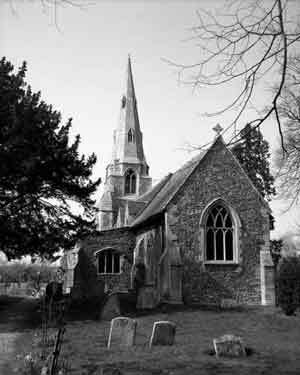 The couple were married at the church of St Michael the Archangel in Aldershot in Southampton on 4 October 1873. At the time David was a member of the Rifle Brigade at Aldershot and his father was said to be Charles Bodger, a wheelwright and carpenter. The wedding was witnessed by William Ambrose Chettleburgh and Frances Emma Wright. We think that Caroline was born at Broomfield in Essex in 1847, the daughter of Joseph Wilsher and Elizabeth Darnell who were married at Islington in London in 1862. While still to be confirmed, it seems that Caroline died sometime between 1873 and the time of the 1881 census which has a David Bodger (a 38 year-old widower and labourer born at Graffham) boarding with John and Matilda Legget at Frieston in Lincolnshire. The 1891 census has David Bodger (a 47 year-old gardener) lodging at Christchurch in Hampshire with his wife Alice (born in Netley in Hampshire in 1866) and daughters Martha Jane (born in Netley in 1897) and Beatrice Bodger (8m, Bournemouth). Note that the Catherine House Index shows that a Mary Elizabeth Bodger was born in the Christchurch RD of Hampshire in 1895. Jayne Tysoe, a descendant of David's older brother Joseph Bodger, tells us that David died on 7 May 1896 while lodging in the Derbyshire township of Long Eaton, where Joseph's grandson, Frederick Ernest Sharman Tysoe, and his family later lived. Whether or not this was merely a coincidence and why David was lodging there remains unknown. The Catherine House index indicates that David's wife, Alice, married a Fred House in the July quarter of 1899 in the South Stoneham district of Hampshire. House, born at Christchurch in Hampshire was a driver in the Royal Horse Artillery (RHA) at Christchurch in Hampshire and may well have been a colleague of David's. The 1901 census shows an Alice House (34, married and born at Netley) as the head of her household on Iford Lane in Iford in Hampshire. With her were five daughters: Martha J. Bodger (13, Netley), Beatrice Bodger (10, Bournemouth, Hants), Martha May House (5, Christchurch, Hants), Laura House (3, Christchurch) and Rose House (1, Christchurch). Her husband, Fred House, is shown on the list of soldiers in the Royal Horse Artillery who were stationed at Christchurch. The 1911 census shows Fred (43 year-old labourer born at Christchurch Hants) and Alice House (44, Netley, Hants) living at Casella Stourvale Road in Pokesdown Bournemouth in Hampshire. With them were six children - Mary (15), Laura (13), Rose (11), Lily (9), Elsie (6) and Fred House (4) all of whom were married at Christchurch - and Fred's mother, Emma House (73, Christchurch). Born at Netley in Hampshire, their eldest daughter, Martha Jane Bodger (1888-1966), was living with her mother Alice House in Iford in Hampshire in 1901. In 1907 she married Walter Sidney Herbert Hudspith (1885-1947) in the Christchurch RD of Hampshire. Records in the UK National Archives show that 213555 Walter Sidney Herbert Huspith, born at Newbridge in Dublin in Ireland on 13 October 1895, served in the British Armed Forces. The 1901 census shows Walter S. Hudspith (15, Dublin) on board HM Ship St Vincent, a First Class Training Ship stationed at Portsmouth in Hampshire and under the command of Commodore Cecil F. Thursby. The 1911 census shows Walter (26 year-old carman born at Newbridge County Kildare in Ireland) and Martha Hudspith (23, Netly Hants) living at Oakdene Stourvale Road Pokesdown Christchurch in Hampshire. With them were two children - Herbert (2) and Arthur Hudspith (11m) both of whom were born at Bournemouth - and two boarders, Frederick Whitstow and May Farley. Walter and Martha had been married three years and had two children. Steve Erwood's Family Tree on Ancestry.com tells us that Walter and Martha eventually had ten children: Herbert Charles G. (1908-79), Arthur W. F. (1910), Phyllis G. E. (1912-12). Winifred Muriel (1913-2001), Vera J. (1921-65), Benjamin (1922-22), George Hudspith (1927-27) and three others. The Catherine House Index confirms all those born from 1916 on and indicates the other three were John E. (1930), Violet M. (1916) and Eva G. (1919) Hudspith where all were born at Bournemouth in Hampshire. It also shows that Walter S. H. Hudspith, born in around 1886, died in the Bournemouth RD of Hampshire in 1947 and Martha J. Hudspith, born in around 1888, died in the Bournemouth RD of Hampshire in 1966. The UK National Probate Calendar shows that Walter Sidney Herbert Hudspith of 65 Castlemain Ave West Southbourne Bournemouth died 12 April 1947. Probate to Martha Jane Hudspith, widow. David and Alice's second daughter, Gladys Dorothy Beatrice Bodger (1890-1965) was living with her mother at Ilford in Hampshire at the time of the 1901 census. The 1911 census has a Gladys Beatrice Bodger (20, Bournemouth) working as a housemaid at the home of Henry Duke Dillon-Tenchard at 'The Ridge Durestone Swanage' in Dorset. The Catherine House Index shows that Beatrice married Richard Harold Stott (1895-1929) in the Christchurch RD of Hampshire in 1915. Harold was born at Ashton-in Makerfield in Lancashire, the son of Thomas Stott and Jane Vernon. 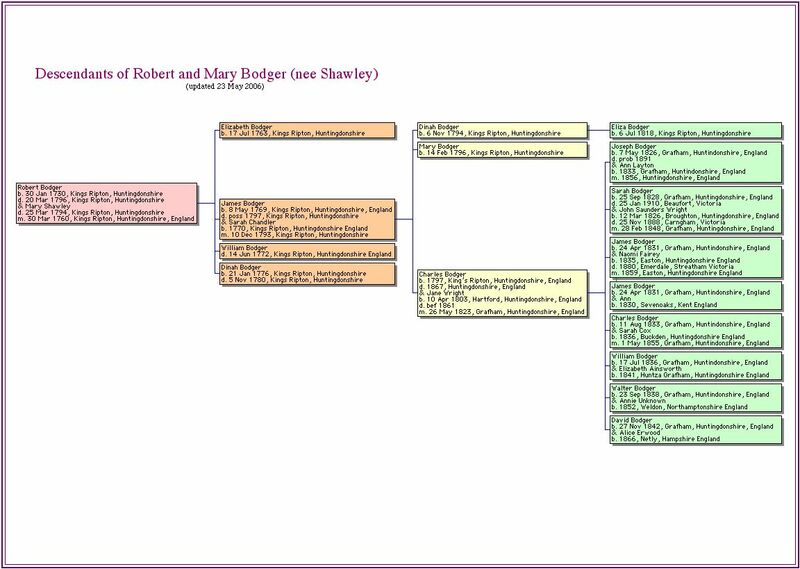 According to Steve Erwood's Family Tree on Ancestry.com, Richard and Beatrice had five children: Dorothy Phyllis Murial Stott (1916-28), Harold Richard Stott (1919-2002), Leonard Stott (1928-9) and two others. This is confirmed by the Catherine House Index which suggests the other two children were Elsie M. (1922, Wigan) and Betty Stott (1926, Wigan). The UK National Probate Calendar shows that Richard Harold Stott of 144 Bolton Road Ashton-in-Makerfield died on 15 April 1929 at Royal Albert Infirmary in Wigan. Probate was granted to Gladys Dorothy Beatrice Stott, widow. Beatrice died in the Poole registration district of Dorset in 1965. Last updated: 10 February 2014. 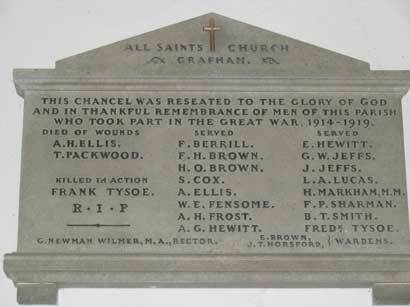 'Grafham All Saints Church in 2006' and 'WWI Memorial Plaque', courtesy of Jayne Tysoe. 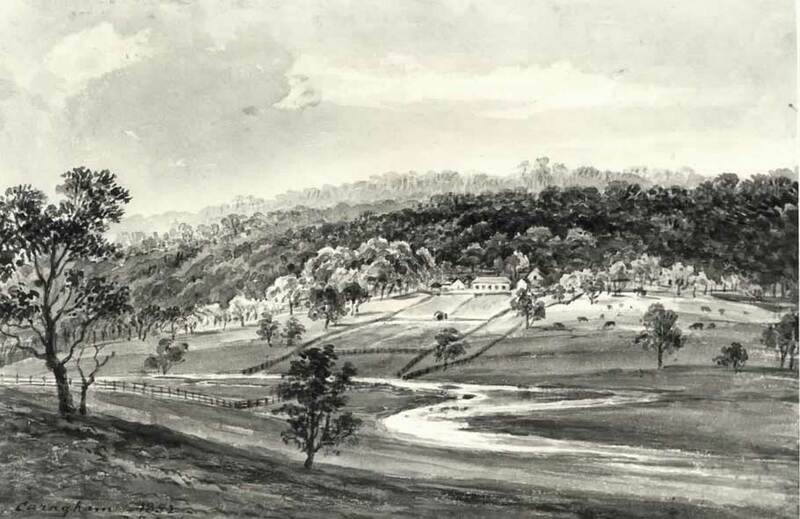 Philip Russell's sheep station at Carngham in Victoria in 1852. Sepia wash drawing by D. E. Cooper 1813-1904, courtesy of the National Library of Australia. Charles and Sarah Bodger c1890, and Fred Bodger in 1933 courtesy of Irene Restall. 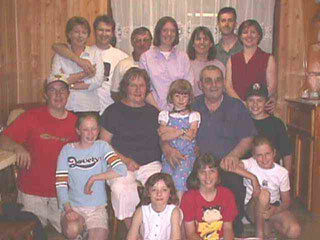 Tizzard family in Ballarat in 2000, courtesy of Cynthia Tizzard. Bodger wedding photo, courtesy of Vicky Bremner. 'William Bodger and his three sons' and 'Hector Charles Bodger in naval uniform', courtesy of Doreen Reeve. 'Sgt Herbert Ainsworth Bodger and his brothers' and 'Herbert and Edie leaving for Wau', courtesy of Ian and Moina Bodger.